Shutdown Diary: War Of Words, And A Victory For Some WWII Vets : It's All Politics Day 1 of the federal government shutdown, 2013 edition, was business as usual, at least when it came to each side trying to win the public relations fight. 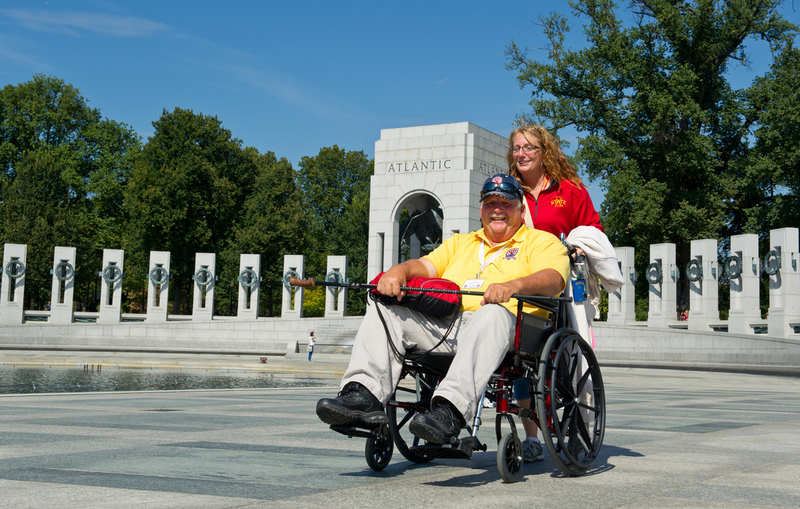 Veterans who came to Washington Tuesday to see the World War II memorial on the National Mall were able to complete their visit, although the memorial — like other federal museums and memorials — was officially closed to the public. Day 1 of the federal government shutdown, 2013 edition, was business as usual, at least when it came to each side trying to win the message war and keep the pressure on the political opposition in the hope of getting them to blink first. President Obama had a White House Rose Garden event to mark what also was the first day individuals were able to enroll in the Affordable Care Act's health insurance exchanges. With real people who would benefit from the law arrayed behind him in a photo op, he used the moment to blast Republicans. "They've shut down the government over an ideological crusade to deny affordable health insurance to millions of Americans," Obama said. "In other words, they demanded ransom just for doing their job." Congressional Republicans worked a two-pronged strategy. First, they portrayed themselves as eager to negotiate with Democrats but disappointed that the other party declined to talk with them. Second, they proposed a plan suggested by Sen. Ted Cruz, R-Texas, to fund various federal agencies and services in a piecemeal way, like the National Park Service, Veterans Affairs and the District of Columbia, in a partial reversal of the shutdown. They were so eager, in fact, that some House Republicans held a photo op where the other side of the table was empty (to symbolize that they lacked Democratic negotiating partners). "I would say none of us want to be in a shutdown," House Majority Leader Eric Cantor, R-Va., said. "The way to resolve our differences is to sit down and talk. And as you can see, there's no one here on the other side of the table." Senate Majority Leader Harry Reid, D-Nev., didn't spare the sarcasm: "Now that's really so unique," he said of the GOP photo op. "Has it ever been done before? Only 5(000) or 6,000 times since I've been in Washington." Democrats were equally dismissive of the House GOP's idea of a piecemeal reopening of the government, which was aimed, in part, at making it appear that Democrats were the reason national parks remained closed. Jay Carney, the president's press secretary, said the proposal pointed to an "utter lack of seriousness." Sen. Mitch McConnell, R-Ky., the Senate minority leader, reinforced his message that Democratic intransigence is to blame. "It's pretty clear to me, at least at this point, that neither the Senate Democratic majority nor the president of the United States have any interest whatsoever in entering into any discussions about how to resolve this impasse." A group of World War II veterans found themselves in the shutdown news cycle Tuesday. The elderly men were confronted by barriers and police tape at the National World War II Memorial, which was closed because of the shutdown. But aided by Republican congressmen including Louie Gohmert of Texas and Steve King of Iowa, the vets got into the closed memorial, although it's not entirely clear how, according to The Washington Post. Shutdown-related promotions sprang up around Washington. A local Italian restaurant offered free use of its private dining rooms to Obama, Reid and House Speaker John Boehner to negotiate over pasta. Another local restaurant offered furloughed federal workers a free daily cup of coffee. Members of Congress, however, would be charged double the price. It was proof that one person's shutdown is another's marketing opportunity.